Burlington bus riders have been waiting 18 years for the arrival of an indoor station in the downtown area. That’s not quite as long as the city has anticipated the Southern Connector, but almost. Meanwhile, conditions at the current terminal on Cherry Street have grown more unpleasant in recent years as ridership has increased along with the number and frequency of buses arriving and departing. At peak times, 13 buses jockey for spots along the south side of Cherry Street. A few commuters jog along the traffic lane in search of their bus rather than using the narrow sidewalk clogged with fellow passengers — some with bikes, wheelchairs and baby carriages — who are alighting or waiting to board. Then all the buses pull out at once, creating congestion that extends all the way to the traffic light at South Winooski Avenue. It’s a dangerous, polluted mess. Downtown bus users are reminded every day that “public transport occupies a low place on the totem pole of priorities,” observes Chapin Spencer, who is executive director of Local Motion, the bicycle and pedestrian advocacy organization. Spencer is also vice chair of the commission overseeing the Chittenden County Transportation Authority, which operates the city buses. In his opinion, failure to replace “the outdoor, unheated, cramped” Cherry Street terminal with a modern facility represents “the single biggest impediment to continued ridership growth” on the CCTA system. Noting that his organization has been using Cherry Street as its central dispatch point since 1970, CCTA general manager Christopher Cole acknowledges, “We long [ago] outgrew our ability to operate efficiently there.” The situation today “isn’t good for the Marketplace or for CCTA,” Cole adds. Even as the city seeks to discourage homeless and mentally ill people from loitering on the downtown pedestrian mall — by temporarily removing benches, for example — nothing is being done to reduce the crowds waiting for buses on Cherry Street. Nearly 193,000 rides were recorded on the CCTA system in May. That’s down 0.6 percent from the same month last year, but up 21.6 percent from the total for May 2005. The numbers demonstrate CCTA’s ability to retain riders even when the cost of driving drops. The network has expanded, as well, with new runs to Williston joining seven local routes, and commuter services to Middlebury, Milton, Montpelier, St. Albans and Waterbury. 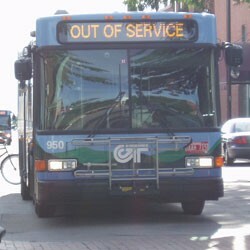 About 60,000 monthly bus boardings take place on Cherry Street. 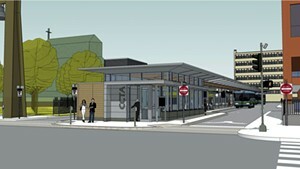 Construction of a central CCTA station was first proposed in 1992. A specific plan took shape in subsequent years, with the design of a Downtown Transit Center formally presented in 2001. This $15 million “multimodal” facility was envisioned as occupying the Battery Street building that once housed Waterfront Video — now April Cornell. It was intended to serve not just bus riders but train, taxi and ferry passengers, as well. Mayor Peter Clavelle’s administration spent $850,000 to acquire the property and $1.4 million in federal funds for engineering work and environmental analysis. But in 2003, just as the Burlington City Council was moving toward final approval of the plan, an outpouring of public opposition forced Clavelle to cancel the project. Objections centered on the prospect of buses massed in a desirable location overlooking the waterfront. Efforts to devise an alternative were stymied by the Bush administration’s refusal to allow the city to spend any more federal funds on the design of a transit center. That policy has changed under Obama. Cole says CCTA expects federal planning money to become available again within the next couple of months. The process of identifying and securing a new site may then move forward in earnest. Larry Kupferman, director of the city’s Community & Economic Development Office, says the Vermont Department of Labor building on Pearl near Pine Street is considered an “ideal” location, but a new Burlington location for DOL would first have to be found. The city-owned parking lot at the northeast corner of Main Street and South Winooski Avenue has also been eyed as a potential spot for a transit center. In the interim, CCTA and the city are readying improvements for the current terminal area. Unheated bus shelters will be built on Cherry Street a couple of blocks west of Church Street, and others will be added on St. Paul Street at a total cost of $186,000, Cole says. Besides reducing sidewalk congestion, the aim is to route some outward-bound buses along Pearl Street rather than having them all move across the Marketplace, as is currently the case. Burlington Department of Public Works director Steve Goodkind says a traffic signal “preemption” is also planned for the corner of Cherry Street and South Winooski Avenue, giving buses the right of way at that intersection.